Cevert was one of the most colorful racing drivers of the early 1970s. In the tumultuous, tragic arena that was Formula One racing at the time, few showed more flair and promise, and no one ended their career more heartrendingly. Cevert was one of the most colorful racing drivers of the early 1970s. In the tumultuous, tragic arena that was Formula One racing at the time, few showed more flair and promise, and no one ended his career more heartrendingly than Cévert, the son of a Paris jeweler and brother-in-law of Grand Prix driver Jean-Pierre Beltoise. After winning the French Formula 3 Championship in 1968, Cévert joined the Tecno Formula 2 team and finished third overall in 1969, driving in the F2 class of the German Grand Prix. When Jackie Stewart had a hard time getting around Cévert in an F2 race at Crystal Palace the same year, Stewart told his team manager Ken Tyrrell to keep an eye on the young Frenchman. The following year, when Johnny Servoz-Gavin suddenly retired from the Tyrrell Formula One team three races into the 1970 season, Tyrrell called upon Cévert to be his number two driver, alongside defending World Champion Stewart. Over the next four seasons, Cévert became the veteran Stewart's devoted protégé. After making his debut at the Dutch Grand Prix at Zandvoort in Tyrrell's second customer March-Ford, he increased his pace and closed the gap to Stewart with virtually every race. He earned his first World Championship point by finishing sixth in the Italian Grand Prix at Monza. Having started from fifth spot, Cévert took the lead from Stewart on lap 14 as the Scot's tires began to go off in the 100° heat. At about half-distance, Cévert finally began to struggle with the same understeer that had plagued Stewart much earlier. Jacky Ickx was closing, and his Firestones were getting better as the race went on. On lap 43, Ickx set the fastest lap of the race, and the gap was down to 2.2 seconds. Then, on lap 49, the alternator on Ickx's Ferrari fell off, punching a hole in the gearbox and spilling oil all over the track! Denny Hulme's McLaren hit the oil and spun into the barrier, bending his front suspension. Hulme was standing beside the track when Cévert came by and also slid off and hit the barrier, but he kept going, now 29 seconds in the lead! Cévert coasted home, taking both hands off the wheel to wave as he crossed the line. Cévert became only the second Frenchman to win a Grand Prix (Maurice Trintignant won at Monaco in 1955 and 1958), and it was the high point of his career, helping him take third place in the 1971 Driver's Championship behind Stewart and Ickx. Great expectations for Cévert, Stewart and Tyrrell were not fulfilled in 1972 as Emerson Fittipaldi and Lotus won the Driver's and Constructor's Championships. Cévert finished in the points only three times, with second places at Belgium and the US, and a fourth at his home race in France at the Clermont-Ferrand circuit. 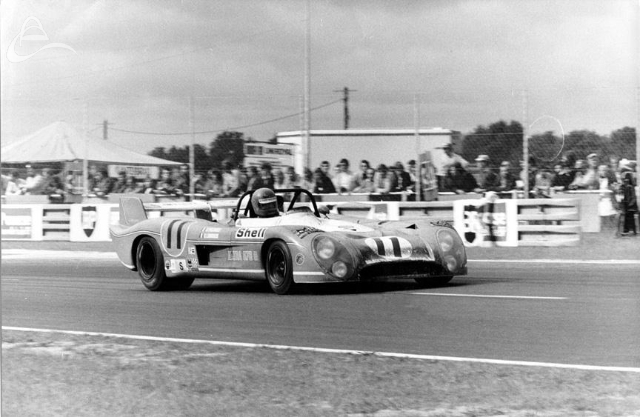 One bright spot in a disappointing year for Cévert was his second place finish at the 24 hours of Le Mans, driving a Matra-Simca 670 with New Zealand's Howden Ganley. In 1973, the Tyrrell team was back on top in Formula One and Cévert showed he was capable of running with Stewart at almost every race. He finished second six times, three times behind Stewart, who acknowledged that, at times, the Frenchman had been a very "obedient" teammate. As Cévert began to draw even with Stewart's driving abilities, the Scot was secretly planning to retire after the last race of the season in the United States. For the 1974 season, Cévert would be Tyrrell's well deserving team leader. Tragically, at Watkins Glen, with Stewart having already clinched his third World Championship, Cévert was killed during Saturday afternoon qualifying while battling for pole position with Ronnie Peterson. He was 29 years old.